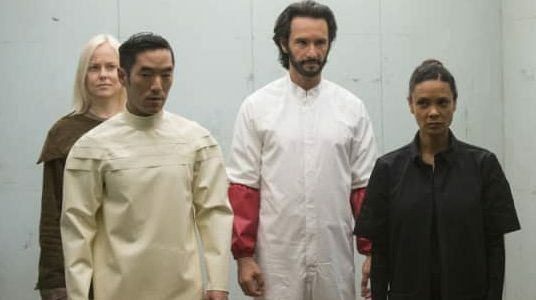 "A fitting, if unsatisfying end to season one"
Way back in October, in my review of the Westworld premiere, I wrote a bit about the problem baked into a series about robots slowly gaining sentience: we already know the endgame. And look what happened. But, considering so much of the finale was spent solving mysteries most of the audience had long ago figured out, I can't quite declare the first season of Westworld a success. But I do have some high hopes for season two, assuming Jonathan Nolan and Lisa Joy lay off the puzzle box mysteries and just tell us a damn story- which was exactly what happened in the final third of the season finale. First, we must dispense with the first chunk of the episode, which, like the previous weeks, spent too much time unpacking mysteries we already knew the answer too. The reveal that William was indeed the Man in Black, only 30-some years in the past was clearly meant to have more of an emotional impact on the audience than it likely did (that wonderful visual transition from young William taking Logan's hat and then lifting his head up as the Man in Black was a thing of beauty to watch, but had no emotional impact for me beyond making me note that the major internet theory was right on the money). It was Dolores's reaction that made the ensuing arc for both character really resonate. Dolores has been the one major complication on the show. Since so much of her story was told over three different timelines, it made it nearly impossible to follow every twist and turn (although, I'm sure someone out there will put together a supercut with her story told chronologically). However, once her purpose was revealed, that choice in writing actually made sense. As we discovered, Dolores was simply reliving the same loop over and over- experiencing her journey with William, ending at the same point: the church. So, while it might not have looked like it across all her timelines, Dolores was growing and changing in each period, moving closer and closer to reaching Arnold's, and now, Ford's, endgame. And that endgame is what we've all been waiting for, consciously or unconsciously, as well all knew at some point, the creatures would rebel against their creators. That's just what happens when you create really smart robots. What makes this tried and true story work, however, is its execution. Now, I've mentioned before in different reviews for different shows (including last week's Westworld review) that the key to good television is character. It isn't playing the game of how many secrets and surprises can you have, or how long can you draw out a reveal (something that Westworld has traded in throughout this first season to diminishing returns). Once Westworld dropped all the artifice of timeline and character identity questions and just gave us story and defined characters, things got really good. The Maeve arc has been the crowning jewel of season one. It worked so well because what we saw was what we got. We understood Maeve's journey because it was simple and focused on creating a character we cared about (even learning that Maeve has done this same dance before didn't cheapen the story, it added a layer of sadness to it). Hell, even Charlotte Hale (Tessa Thompson was so very good in this episode) said it: "This place is complicated enough already." And once Ford tipped his hand in the finale, I found myself enjoying the episode a great deal more than I had for the previous hour. I wish the show had let us in on Ford's goal earlier (although, I suppose we should have assumed he had something up his sleeve in case he was forced out, but some hint that he joined Team Arnold would have been nice). Knowing what each character wanted, knowing who each character really was, and watching the story unfold without any confusion or hint of secrecy was wonderful. And you know what? I want to see a story where Dolores gets to remain sentient. I want to watch Maeve escape the park and move beyond (her leaving the train, while hinting that this entire journey for each host may be a tragedy in the end, was the one really disappointing moment of the episode for me, albeit because I was really rooting for her). I want to see the Delos bigwigs get what they deserve. But I wanted all of those things after episode two. And we had to wait another eight episodes to get a sense that the show also wants those same things to happen. Which was what made the series so frustrating for me at times. It took so long to get the point we all knew it would eventually reach. It slogged through mysteries we solved weeks ahead of the story. But we reached the end we all wanted to reach. Hopefully season two doesn't force us to wait so long to get a chance to enjoy a character driven story. Final Thoughts: -- For having one of the most talented casts on television, Westworld's first season was pretty spotty with using these actors to their full potential. Yes, Evan Rachel Wood, Jimmi Simpson, Thandie Newton, and Jeffrey Wright were given a lot to do. But man, did the show waste the rest of the cast. -- This was one of the most gorgeously shot shows this year. Those vistas, the amazing costumes, the colors used, all of it was just spectacular. -- In case you missed it, there was a fun post-credit scene with Armistice continuing her fight against security, despite having her arm crushed in the door. -- This weekend, Syfy had the original Westworld film on, so I managed to watch it. It was a nice background to have when the finale showed us a tease of one of the other parks in the Delos system- an Asian world complete with Asian warriors. In the film, there were two additional worlds alongside Westworld- a medieval realm and an ancient Roman park. It's clear that we'll be getting some new worlds and new stories next year, and hopefully we'll see how much influence Ford and Arnold had over the different parks now under Delos control. -- Season two was ordered, but likely won't be out until 2018. So, we have plenty of time to ruminate over what happened this season. And speculate about season two. Which, will hopefully include no more major mysteries. Or, if it must, it will take into account the brilliant hive mind of the internet and start offering answers faster.